It looks bland, but proved to be engrossing and addictively dip-in-able. 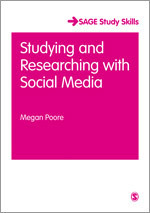 I was sent a review copy of Megan Poore’s book, Studying and Researching with Social Media, in the Sage Study Skills Series. The book is aimed at university students and follows her successful Using Social Media in the Classroom , reviewed on this site in 2012. The first and most obvious thing to comment on is the use of a linear print medium to assist users of social media. While this seems anachronistic, it is, of course, precisely what is needed to assist the transition from print and lecture media to electronic, digital, communication media. The book has been intelligently and thoughtfully organised and well indexed, creating a highly accessible book from which readers can quickly find and select the parts relevant to them. – The Social and Legal Contexts of Using Social Media for Study and Research. Each of these parts is divided into clearly labelled, logical sections. The Contents list occupies three pages at the front of the book and can be used to quickly find the section of immediate relevance. Certainly, some of the information, such as ” What are social networks?” could be found by online searching, but the information provided here is not only conveniently and logically associated, but succinct and relates directly to what a student (or teacher) needs to know. Dr Poore is direct and clear in her purpose. This book is intended to help you harness some of the many social media tools and services in your study and research practice (p.xii). She looks at how, why and the issues that are likely to arise,. going beyond the ‘receiver – transmitter’ model to examine generator/ creator. There is a useful summary at the end of each chapter, direct, respectful and indicating further reading. The book is laced with tips and good, common sense advice, including how to back up work, working with lecturers, cutting slack, the difference between blogging and writing for FaceBook. It deals with how and why to build an online profile. I can see this book being of immense value to a majority of students and teachers. It is practical, accessible, clearly written and direct. The only fault I could find is that, while it is clear about what should be reported to police (p194) it does not suggest how you do this. Most readers will figure it out, but this was the only time in the book when I felt guidance could have been more explicit. While it is directed to a university audience, there are many school students, teachers and parents who would find it very useful. It would also take only a little adaptation to develop a schools version – many would find it an invaluable handbook.